She was wholly unnecessary, although it was explained to me that her version is also a single. Which is also unnecessary. Has the Gwyneth performance happened on the West Coast broadcast yet? she climbed up on the piano, a little Baker Boys style. I definitely didn't know/make that connection. And I think it's safe to say that the majority of people tuning in tonight didn't make it either. 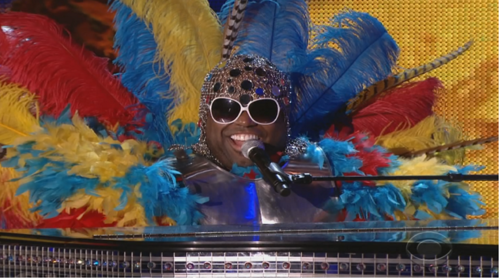 Peeps be thinking that Cee-Lo's outfit was original. Cee-Lo is a bigger liar than even Bono himself. I didn't, but my mind does not have all of Elton's costumes catalogued in my brain.